Tatmadaw must have full military skills, win every battle, have good disciplines and must be proficient in military art. The Tatmadaw must have to use modern military equipments. The Tatmadaw has won battles as Tatmadawmen bravely fight against enemies by sacrificing their lives. 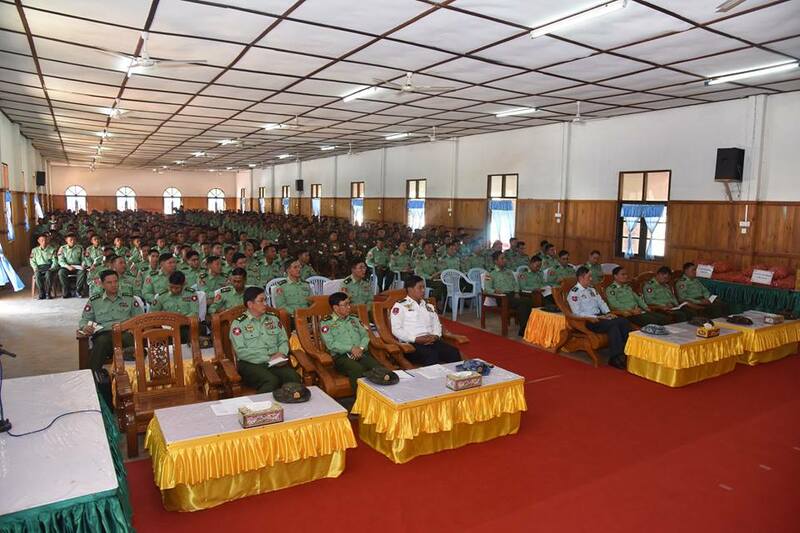 Tatmadawmen will win the trusts of people only when they win battles, said Commander-in-Chief of Defence Services Senior General Min Aung Hlaing, at a meeting with training officers, servicemen and trainees from the local Advanced Military Training Depot in Kengtung Station. The meeting was attended by Commander-in-Chief (Navy) Admiral Tin Aung San, Commander-in-Chief (Air) General Maung Maung Kyaw, senior military officers from the Office of the Commander-in-Chief (Army), the commander of Triangle Region Command, the commandant of the local Advanced Military Training Depot, training officers, servicemen and trainees. 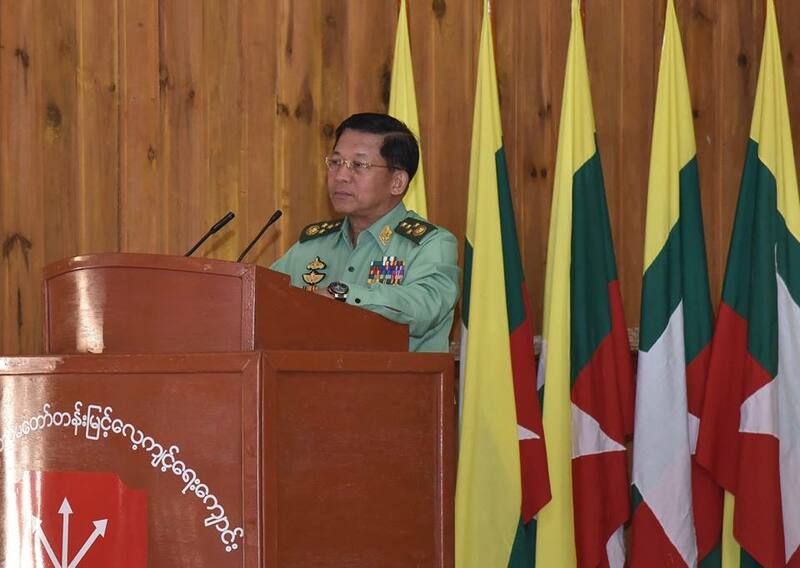 In his speech, the Senior General said since the country gained her independence to date, the Tatmadaw had been steering the country. The Tatmadaw took over the country’s duties in 1988. Since then, the Tatmadaw had been working to keep the country on the multi-party democracy path. Now the country was on the right track to the multi-party democracy chosen by the people. Establishing good democratic practices for the democracy aspired by the people, the Tatmadaw made nation-building endeavours. 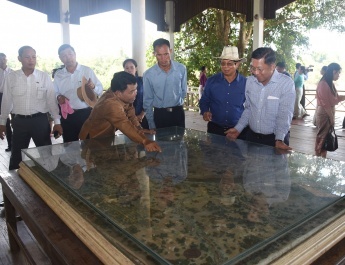 On the other hand, the Tatmadaw started carrying out military building tasks in accord with the democracy system. 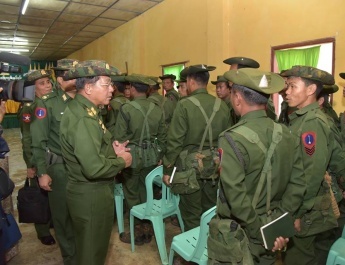 Now the Tatmadaw was working to become a standard army in accord with the democracy system and traditional military operation and keep abreast with the world countries. 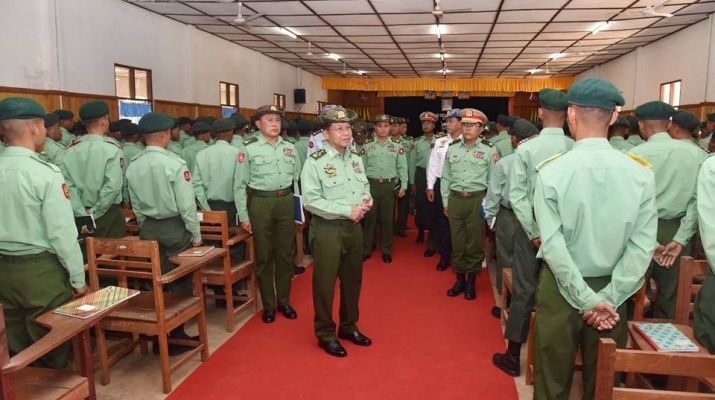 The Senior General noted that the Tatmadaw has good practices of obedience to orders and military disciplines which is to take pride of Tatmadaw’s fine tradition. So, subordinates conscientiously discharge duties assigned by the superior. Based on such point, the Tatmadaw could be developed step by step and it needs to maintain the situation in order to have further improvement. The Tatmadaw operates its agriculture and livestock breeding tasks and sells the products at fair prices in order to control the prices of commodities on one hand and to be able to contribute towards food affairs of the families of military units. The Senior General stressed the need for Tatmadawmen to adjust their income and expense. 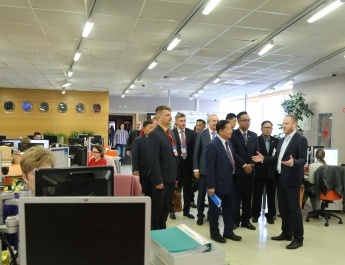 He urged them to avoid drinking alcohol harming health for enabling them to have health and fitness in line with the training motto of the Tatmadaw: it must be healthy and fit, it must be skillful, and it must be brave and courage. Without indulging themselves, they should practise thrifty by understanding spending and profligacy. 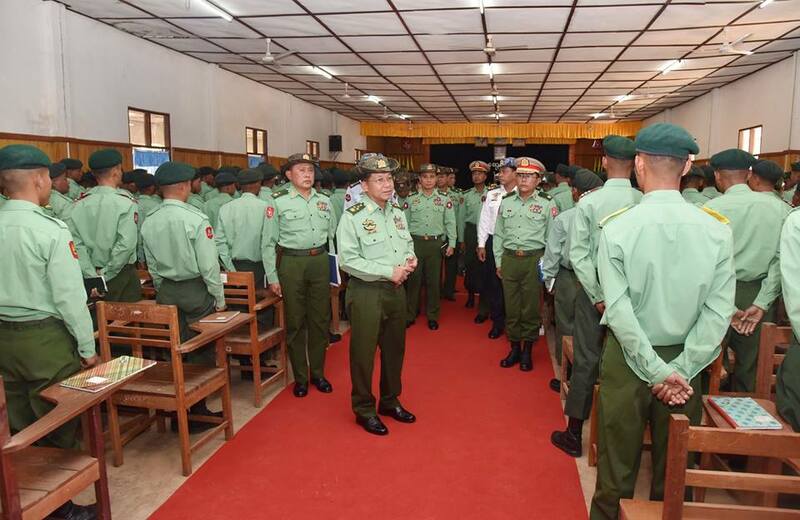 Afterwards, the Senior General highlighted that technique is of great importance in building the Tatmadaw to become a Standard Army. So, efforts are being made for enhancement of education of Tatmadawmen while education qualification is being improved for families of the Tatmadawmen. Likewise, health care services are being provided not only to in-service Tatmadawmen and families but also to war veterans and local people. As such, the Senior General called on the Tatmadawmen to control individual health conditions and always take training for their fitness. The Senior General explained that training depots are providing systematic training for each Tatmadawman to have individual skills. He stressed that trainers must be skillful in respective training sessions whereas trainees need to pursue training and teaching to have skillfulness. If they return to mother units upon completion of the training, they must effectively apply techniques learned from the training depots. Then, the Senior General presented fiction and non-fiction books and publications for the training depot to the commandant. 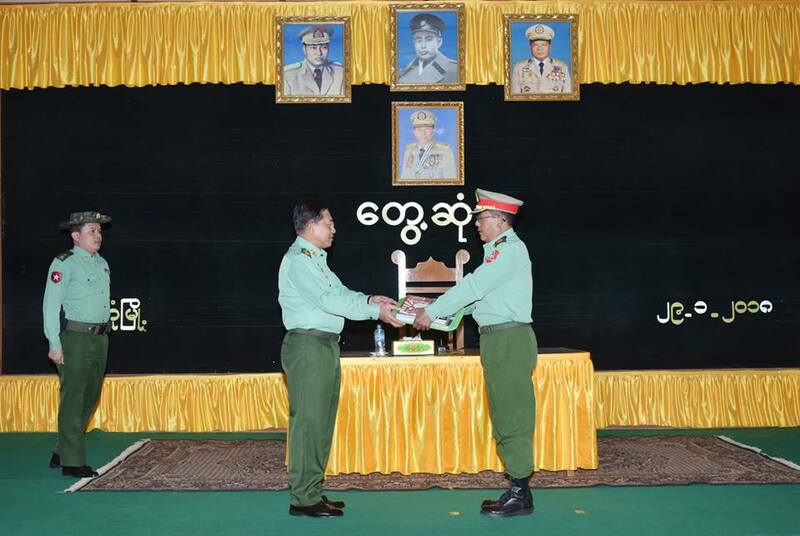 Commander-in-Chief (Navy) Admiral Tin Aung San presented foodstuffs and Commander-in-Chief (Air) General Maung Maung Kyaw, sports gear to officials. After the meeting, the Senior General and party cordially greeted training officers, Tatmadawmen and trainees who attended the ceremony.